Celebrating Spring with a delicious fiddlehead and herb quiche, flavoured with Emmental cheese and topped with fresh herbs. Nothing says Spring nearly as much as fiddleheads, the furled fronds of young Ostrich ferns. Fiddleheads are available for just a very short time every Spring, so when you see them, be sure to pick them up! Look for them right now at your local Loblaws store, but hurry, as they are available for a short time only. Fiddleheads are a unique and delicious green. If you’ve never eaten them, they have a taste profile very similar to asparagus, I think. 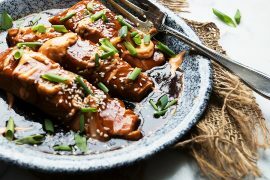 They are a great source of omega-3 and omega-6 fatty acids, and are high in both iron and fibre. They are well worth seeking out. To prepare fiddleheads, you’ll first want to rub the fiddleheads to remove any brown papery husk around the fronds (this may not be necessary, as they may have already had the husk removed.) I like to trim the thick, woody stem end off, just about to the frond. Finally, be sure to rinse the fiddleheads several times in cold water, to remove any husk and dirt. Now, when it comes to cooking, it’s important to note that fiddleheads always need to be cooked. And cooked well. They are not the kind of green that you can eat raw (or add raw to other dishes). To cook fiddleheads, you can either boil or steam them. You’ll want to boil them for about 15 minutes or steam for about 10 minutes. 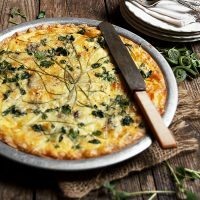 Once boiled or steamed, you can eat them as they are, add them to other dishes (such as this quiche), saute them for a few minutes in a frying pan with some salt, pepper and butter to eat as a side vegetable, or quickly rinse in cold water after cooking to cool and add to salads. I was inspired to make a quiche with my fresh, Spring fiddleheads, but there are dozens of ways to enjoy fiddleheads. Any place you might use asparagus is a good choice for substituting fiddleheads. 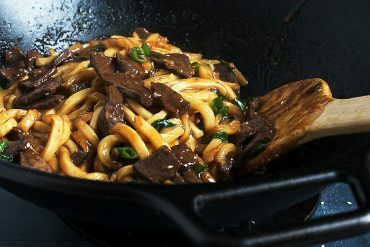 As mentioned above, they are great pan-fried with salt and butter or add some Asian seasoning or sesame seeds, for a little extra flavour. They are great in omelettes or frittatas, soups, salads, risotto and you can also pickle or freeze them, to extend the season. 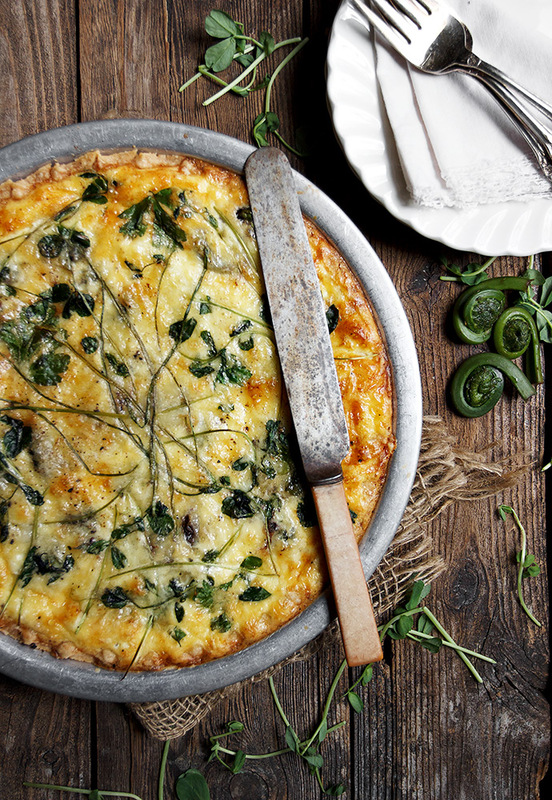 A delicious fiddlehead and herb quiche, flavoured with Emmental cheese and topped with fresh herbs. Assorted herbs such as chives, parsley, pea shoots, thyme etc. Prepare fiddleheads by brushing off any brown husk from around the fronds. Wash well several times in cold water. Trim thick, woody stem end, cutting almost back to the frond. Cook fiddleheads in boiling water for about 15 minutes or steaming for about 10 minutes. Remove/drain and allow to cool slightly. Meanwhile, pre-bake pie shell in a 375° F. oven for 7-8 minutes. Remove and allow to cool slightly. Leave oven on. Saute shallots with oil in a skillet over medium heat, until tender. Set aside. 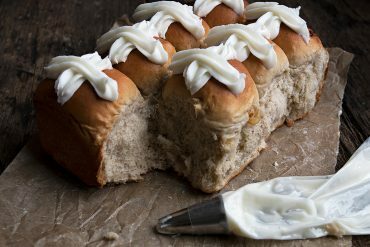 In a medium bowl, whisk together the eggs, cream, nutmeg, salt and pepper. When all ingredients are ready, place pie shell on a baking sheet. Scatter fiddleheads over bottom of cooked pie shell. Sprinkle cooked shallots over top. Distribute shredded cheese over top. Pour egg/cream mixture slowly over-top. Scatter herbs over the top, using a fork to distribute them evenly, then using the backside of the fork to press them gently down into the liquid. Place quiche in the oven on the baking sheet and bake until golden and set, about 30-35 minutes. I just love this beautiful quiche, Jennifer. What a great way to use this delicious veggie. I love Emmental cheese and those wonderful fresh herbs – wow! Your photos always rock! Thanks so much, Robyn. The fiddleheads were delicious with the Emmental! I’ve spotted fiddleheads at the farmer’s market in San Francisco but have never cooked with them. 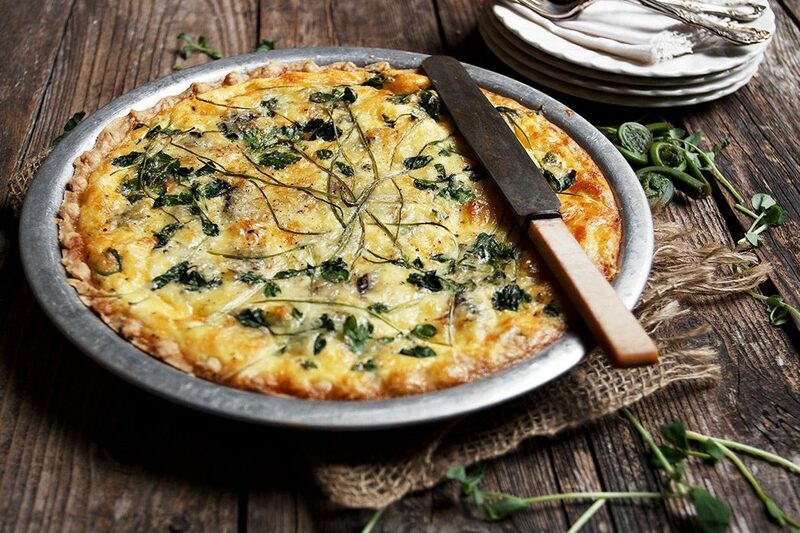 This quiche looks incredible, I love the herbs and touch of nutmeg (my favorite!). I have never tried fiddleheads Jennifer, but I’m thinking I need to look for them the next time I go to the market! 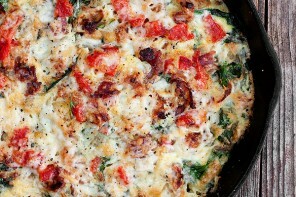 This quiche (always a favorite) looks incredibly delicious! 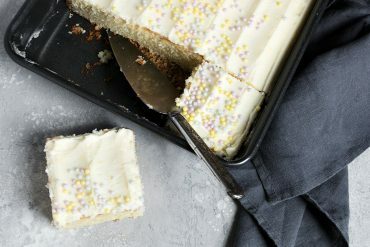 Your photos, as usual, leave me incredibly hungry, wishing I had a slice right in front of me!! Thanks so much, Mary Ann. Quiche is such a satisfying dish! Thanks Linda :) I love quiche too, and haven’t made one in too long, so we really enjoyed this! Oh, the agony! I absolutely LOVE fiddleheads. I’ve had them in Alaska and in NZ (where they’re called Pikopiko) but we can’t get them at all in Australia. Ahhh. I feel for you, Chris. They are such a nice treat, even somewhat hard to find here where they grown wild like crazy! But P.S. 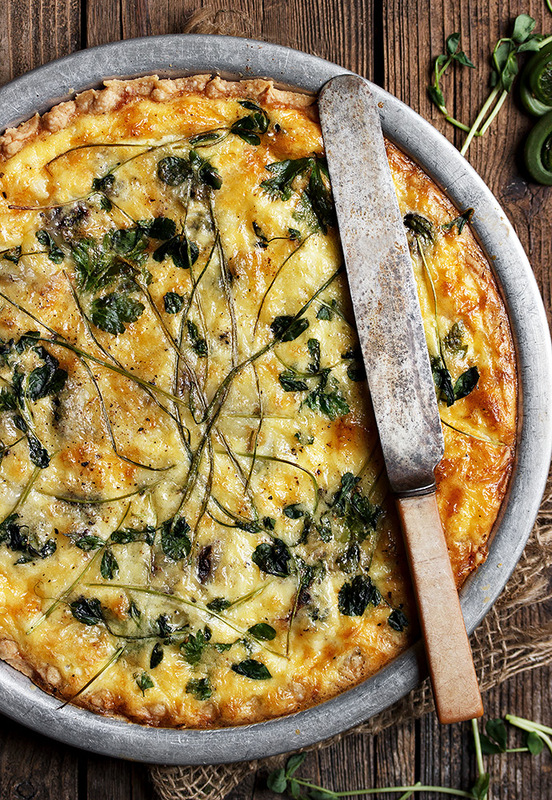 You could easily make this delicious quiche with asparagus. Fiddleheads are so fun to cook with (if you can find them)! I used to pick them all the time as a kid at home, but now that I live in Montreal I have to buy them at the Farmers Market. I sure hope I find some soon! This tart sounds great! 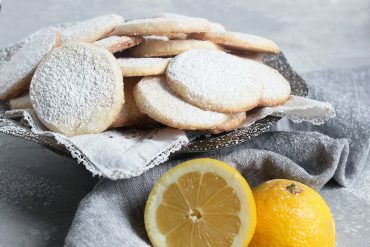 What an inspiring recipe! 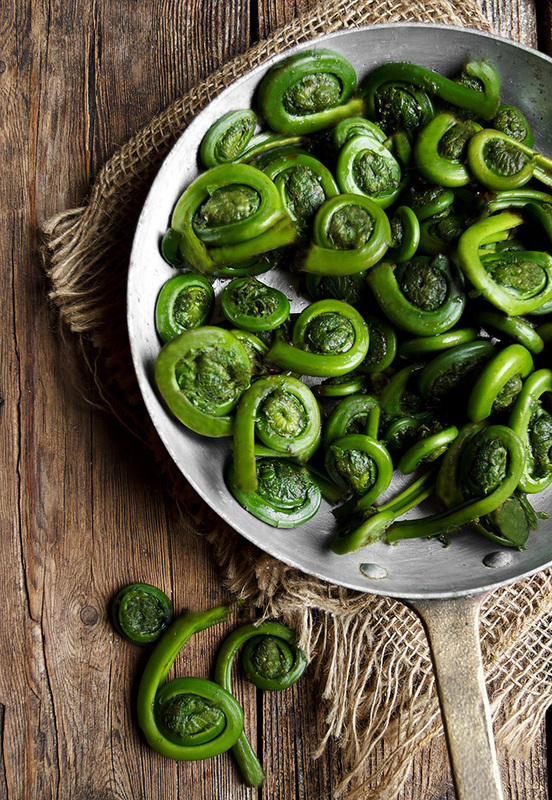 I’ve actually never cooked or eaten fiddleheads.. and knowing me, now that I have a new ingredient to try, I’m not going to stop until I procure some ;) Great post! 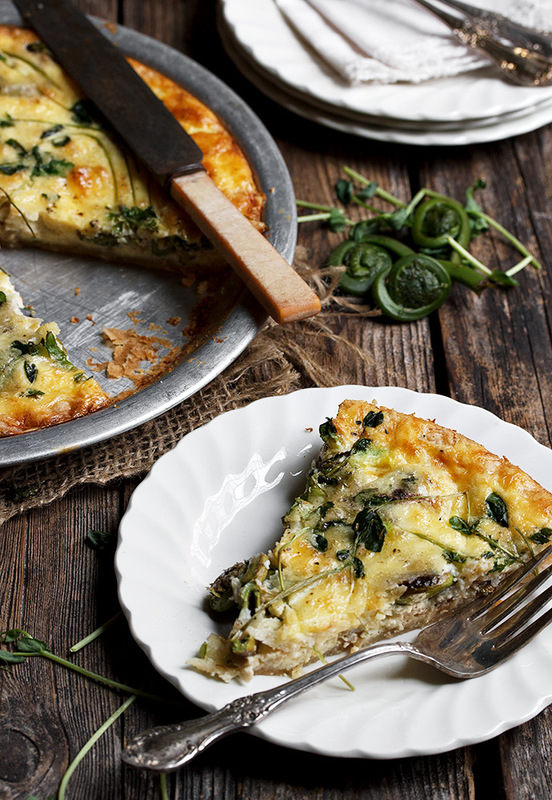 I’m embarrassed to say I’ve never cooked with fiddleheads but this quiche looks totally amazing! I’m going to keep on the lookout for them. Definitely worth trying Chris, if you can find them. Such a unique green! Sounds very interesting – I hope they sell them at our store soon, too. 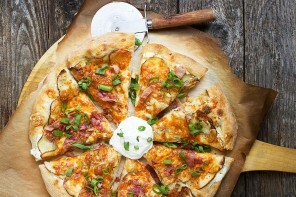 Would love to try this quiche! Thanks :) Keep your eyes peeled, Vivian. They should be in-store very soon, if not already! How beautiful! Those little fiddleheads are so interesting and they look “spring fresh.” Do they taste like asparagus? I’ve never had one but am fascinated. 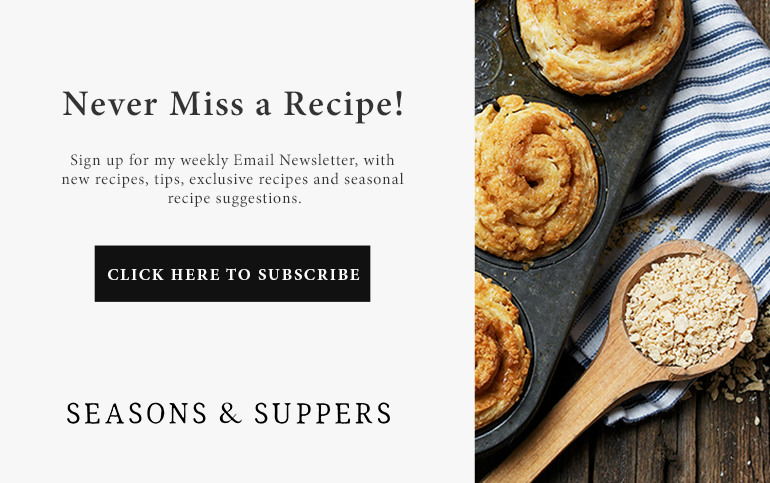 Love a good quiche too – and it looks divine! Thanks so much, Tricia and yes, I think they taste like asparagus. A slightly different texture (softer), but same taste profile. 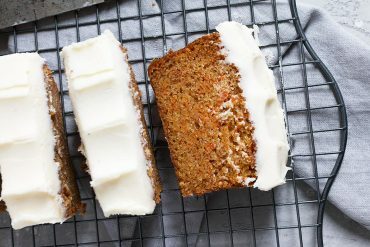 This looks delicious, but I’m having a hard time with the name. Fiddlehead is just too closely related to fiddleback (which are quite prevalent here in the South in the spring, summer, and fall)…. Ridiculous, I know.